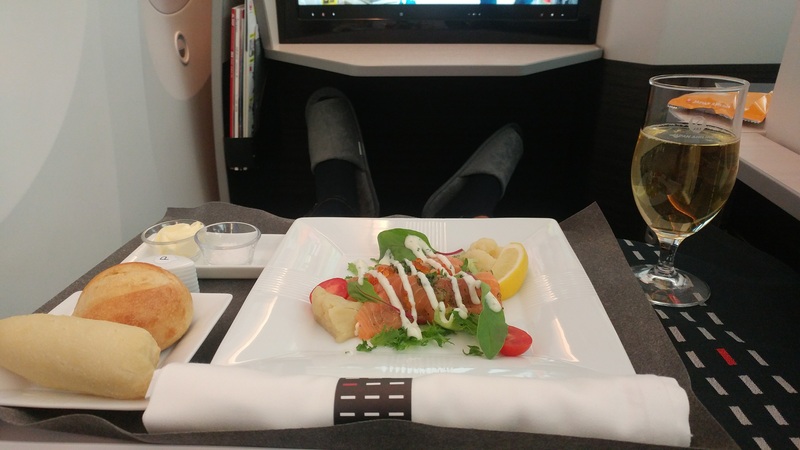 If you want to experience a lot of business class for little points, this post is for you. I too like to sit up front and experience what each airline has to offer for as long as possible. Of course I would never use my hard-earned cash on this $8,000 flight, that’s why I burn points. Alaska Airlines allows you to fly anywhere in ‘Asia’ for just 25,000 miles one-way on Japan Airlines business class (where they fly). For our routing, we flew Singapore to Tokyo then onto New Dehli, all for 25,000 Alaska miles one-way. Alaska Airlines has a very generous stopover policy so we stayed in Tokyo for a few days on our “layover”. 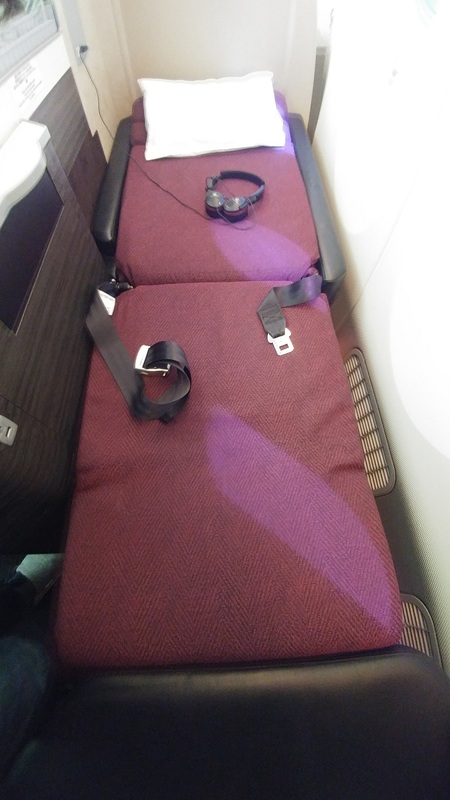 You can read my previous write-up on finding award space on Japan Airlines. Booking JAL flights on Alaska Airlines is straight-forward and their cancellation policy is awesome. The absolute furthest distance possible is from Jakarta to New Dehli. Starting from Singapore, like we did, is a close second. It is 7 hours from SIN to NRT and 8 hours from NRT to DEL. 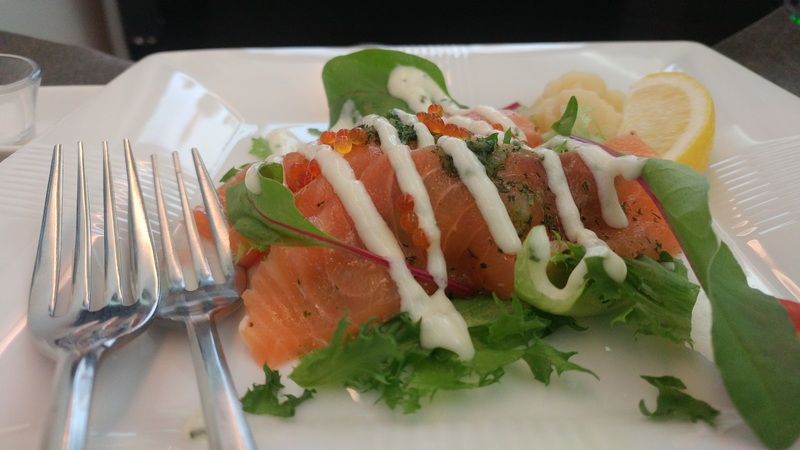 If you count the total time on the plane and count time spent in the Singapore and Narita lounges, we experienced over 20 hours of JAL’s business class ‘offering’. Not bad for 25,000 Alaska miles. Our 9:50PM departure from SIN to HND was on flight #36. 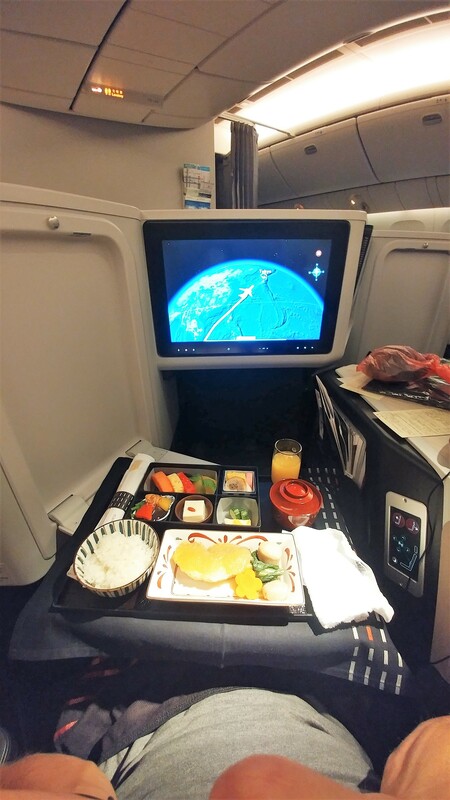 This was operated by a Boeing 777-200ER outfitted with JAL’s latest SkySuite lie-flat seats. 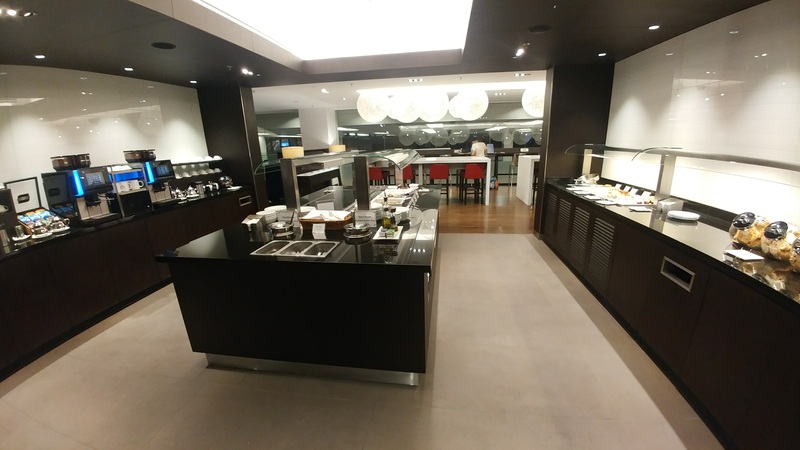 At the Singapore airport we were granted access to the Qantas and British Airways lounges, both OneWorld partners. We stopped in the Qantas lounge first and had a few snacks, it felt very open and was very clean. Being that we were both tired, we headed over to the BA lounge where it was easier to catch a nap. The British Airways lounge, a 50 ft walk from the Qantas lounge, did not have much of a buffet spread but they sure don’t go cheap on the alcohol selection. 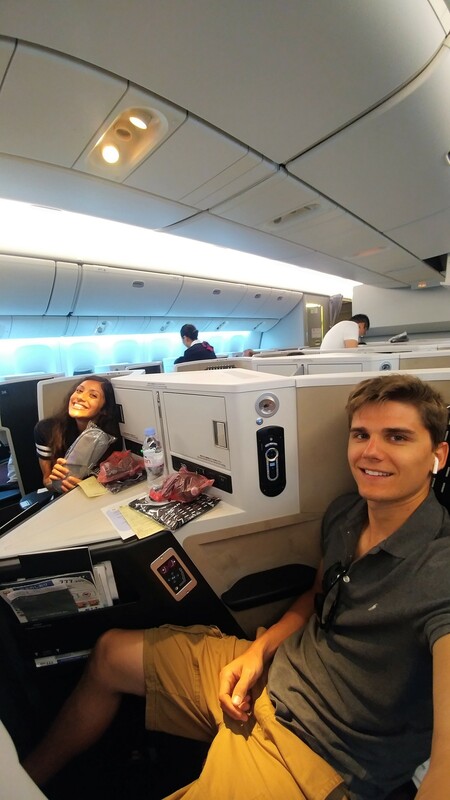 I felt a bit distant from Alyssa in our 3D and 3G seats on the 777-200ER. In order to speak to each other we both had to lean forward rather far. If you are traveling alone, you’d likely prefer this. Check out this interactive 360 degree view to experience the JAL 777-200 business class cabin. Service was prompt but dull. It seemed like the flight attendants were in a constant state of ‘apology’. Perhaps I am far too accustomed to the direct personalities of American FA’s. I would still prefer these JAL flight attendants over any US-based flight attendant for a 7 hour flight. I was able to catch three hours of shut-eye. I was only served one meal, breakfast? The meal was certainly edible but hardly memorable. 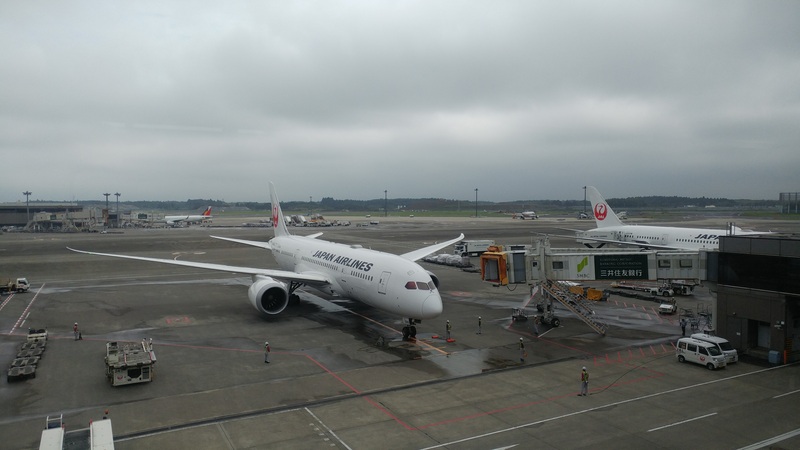 For the Narita to Delhi route, Japan Airlines operates a 787-800 Dreamliner on flight #749. These 787’s are equipped with the latest SkySuites seats (360 view) which offer far more privacy than the SkySuites on the 777-200. The motorized privacy wall, separating our A and C seats, was pretty slick. If you were sitting next to someone you didn’t know, you can completely block them out. For couples, dropping the wall allows for easier conversation since the suites are mostly secluded otherwise. I can’t say enough good things about the space of these SkySuites. You can find a similar setup on select 777-300’s as well as 787-900’s. Service was excellent on this flight, though I felt a rather strong language barrier. The flight attendant had a difficult time explaining [in English] how she dropped the last ice-cream (which I requested). Once we figured out the ‘dilemma’, she offered a Japanese dessert, which was quite tasty. I am glad I was forced to try something new. When I was laying down the flight attendant was very slow to “peek” into the suite. This was certainly appreciated and made it easier to relax without worry that everyone walking down the aisle could see me. Of the two flights, the JAL749 Tokyo to Delhi flight on the 787-8 was far superior. 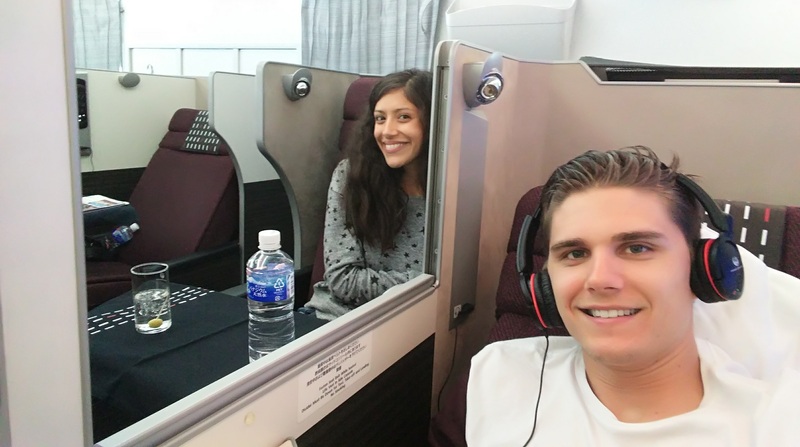 I loved the private feeling suites of the JAL Dreamliner. Flight attendants for the combined 15~ hours were very courteous and extremely responsive when the call button was pressed. I still prefer Cathay’s FA’s overall, though. The Bank of America Alaska Airlines credit card earns you 30,000 miles, enough to book this same one-way. Looking at this same itinerary, you’d pay $8,000~ booking with cash. Redeeming 25,000 miles plus $65 in fees sounds like a much better option. If you have SPG points, you’d only need to transfer 20,000 in order to receive 25,000 Alaska miles. SPG provides a 5,000 point bonus for every 20,000 point transfer made to airlines. 20k SPG points for 20 hours of business class ‘experience’, not bad! Another benefit, on top of the free stopovers, is Alaska’s double open jaw rule. 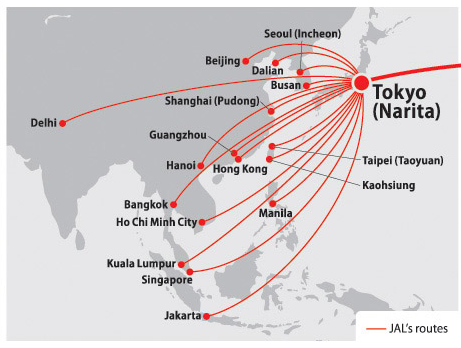 You could fly from Seoul to Tokyo, then Osaka to Bangkok, for the same 25k in business. You can take a week or two to get yourself from Tokyo to Osaka. Remember, Alaska does NOT allow you to mix partners, so you can only fly Japan Airlines in this case.